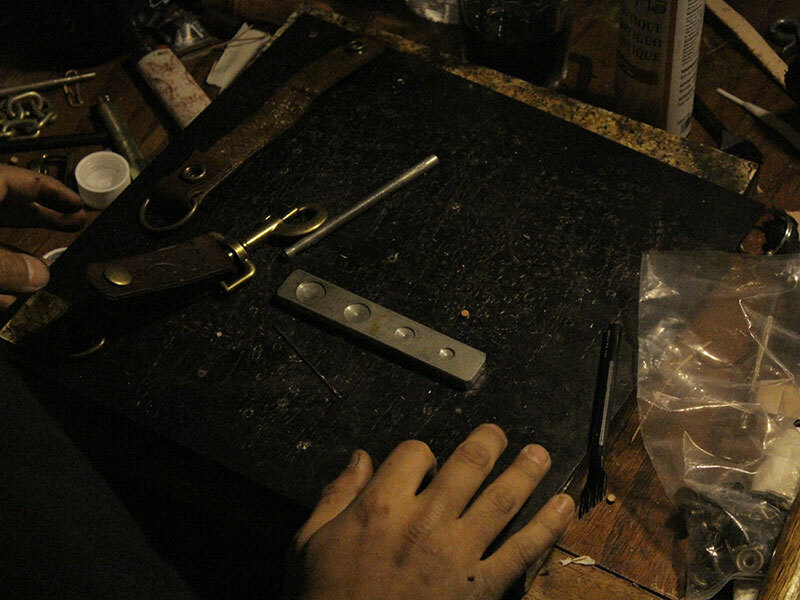 Piercing sounds of a mallet striking a rivet setter echo through the house as Eugene Uichi, 29, carefully binds two pieces of a leather wallet together. At his home in Laguna Hills, Uichi has transformed a large office space into his leather workshop. 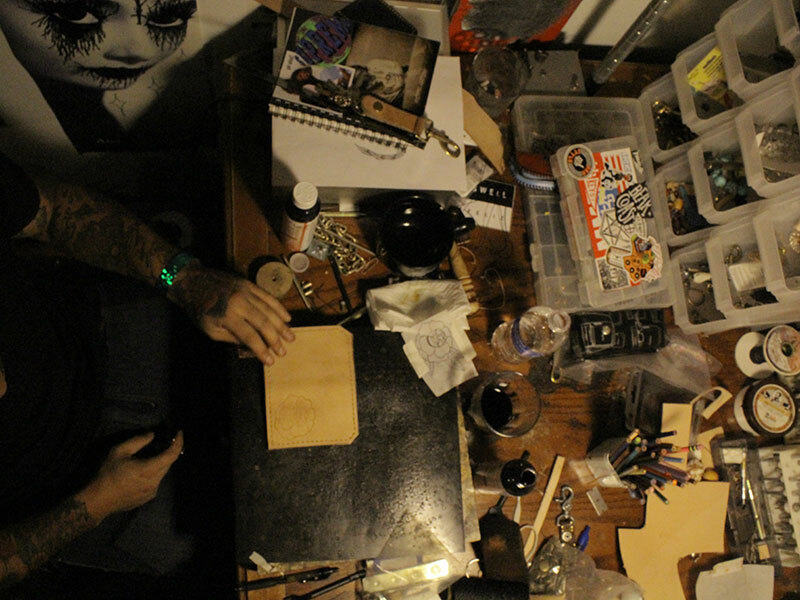 The room is slightly chaotic, as piles of leather scraps lay on the floor and hundreds of different stencil sheets with Uichi’s art are spread over his desk and the surrounding walls. 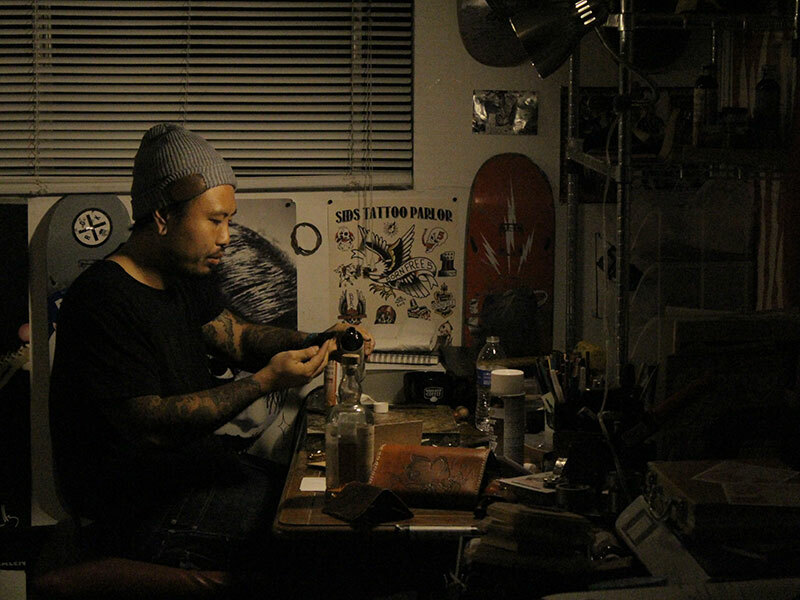 It is in this room, where Uichi spends many hours hand making leather accessories with his art carved into them for his self-run brand, Kyoko. 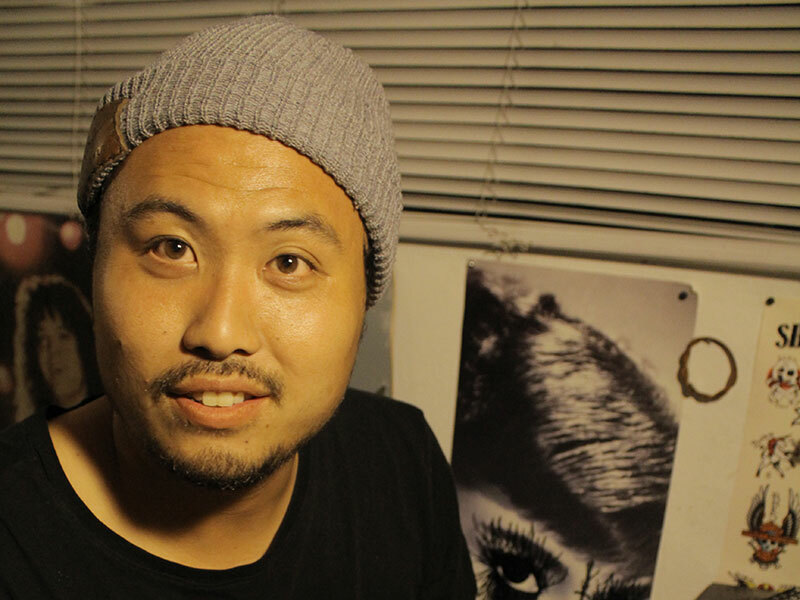 A majority of the accessories he makes are wallets, belts, keychains, and bags, but upon customer request, Uichi has been known to make a variety of uncommon items, such as a percussion symbol bag and a machete belt holster. When taking a close look at his leather pieces, the time he spends dedicated to his work, his tremendous skill as a craftsman, and his innate artistic ability, are self-evident in the great detail seen in his products structural design and bold images carved into them. 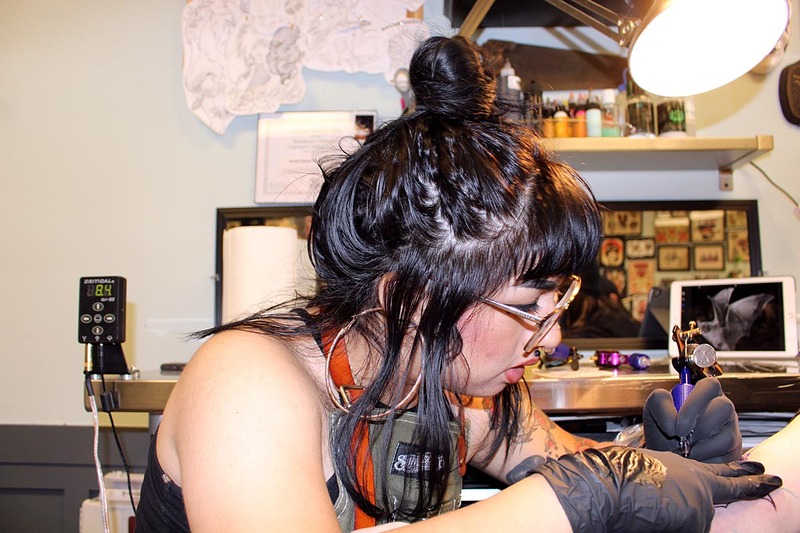 Uichi’s art is inspired by traditional tattoo imagery, of which he has always (adored for their simplistic but iconic/bold style) including styles like, American traditional flash, Japanese traditional, and Middle eastern traditional mandalas. 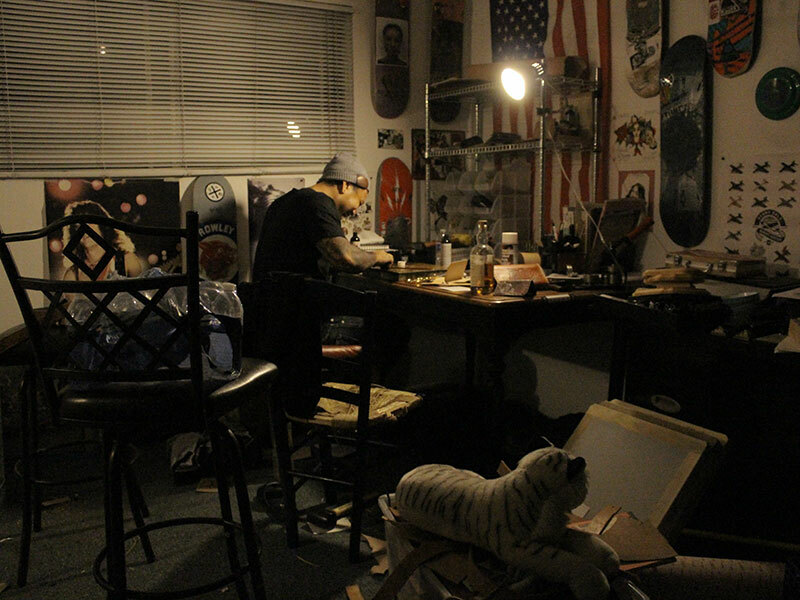 With both handmade and original art, Uichi has combined the two to produce leather products that bear a natural and unique look for many purveyors to appreciate and love, creating a small following in his local Orange County community. Machine manufacturing dominates today’s industry because it has proven to be much more economically viable than the old ways of handmade production. Advances in automated technology have diminished the importance of manual labor, resulting in smaller numbers of those who still make a living performing a trade or skill. With machine manufacturing being the dominate form of production today, the diminished the importance of manual labor has led to a smaller number of those who still make a living performing a trade or skill. 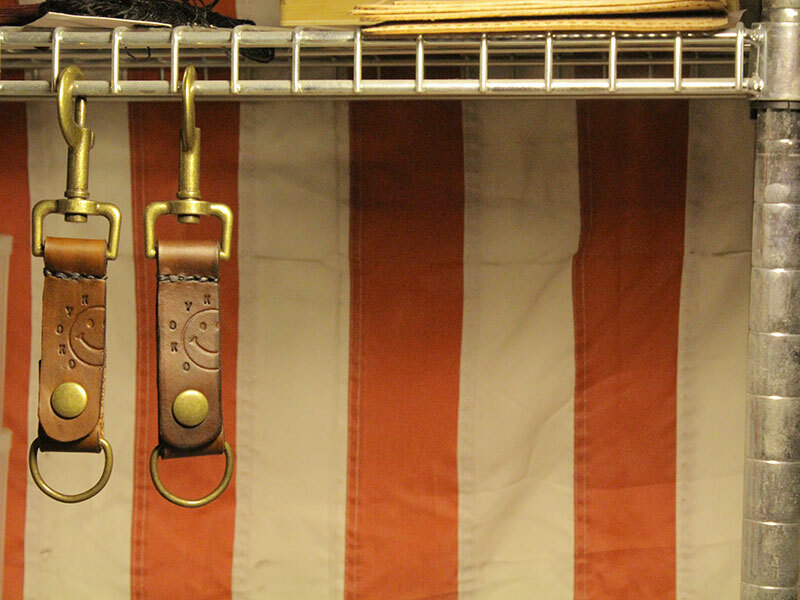 Uichi has been designing and constructing leather goods for the last eight years. 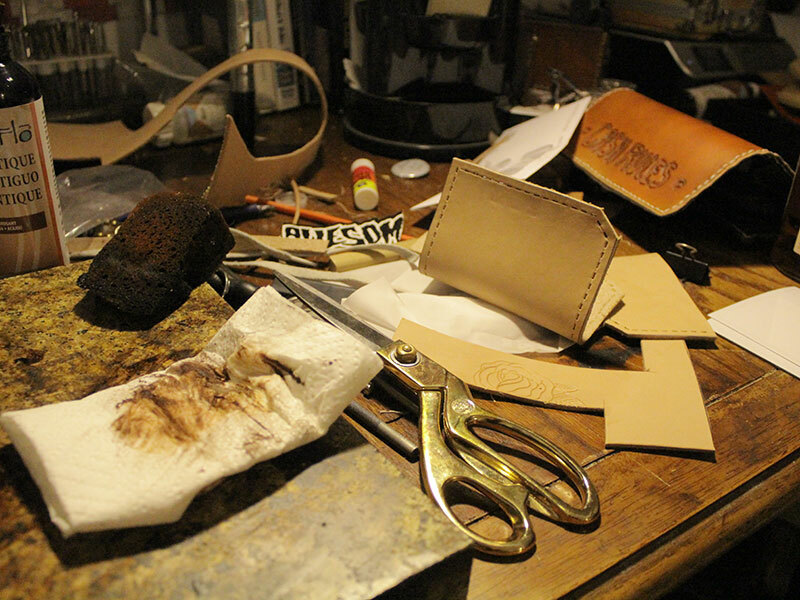 Inside his workroom, Eugene takes a break from his current project and reflects on how he found leather crafting. It wasn’t until Uichi’s friend, Sid, showed him a handmade leather book cover, exposing him to the craft and inspiring him to make his own leather art. Sid, a tattoo artist in Santa Ana, had received the book cover as a gift from a friend in Japan, and on the front panel, the Japanese craftsman carved in one of Sid’s drawings depicting a “rock of ages”, an iconic tattoo image where a woman is shown kneeling underneath a stone cross. 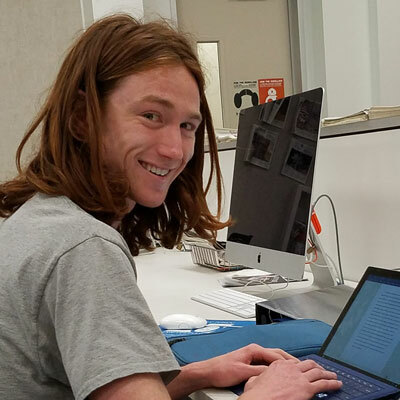 He researched on the internet and began learning about leather making and leather carving. 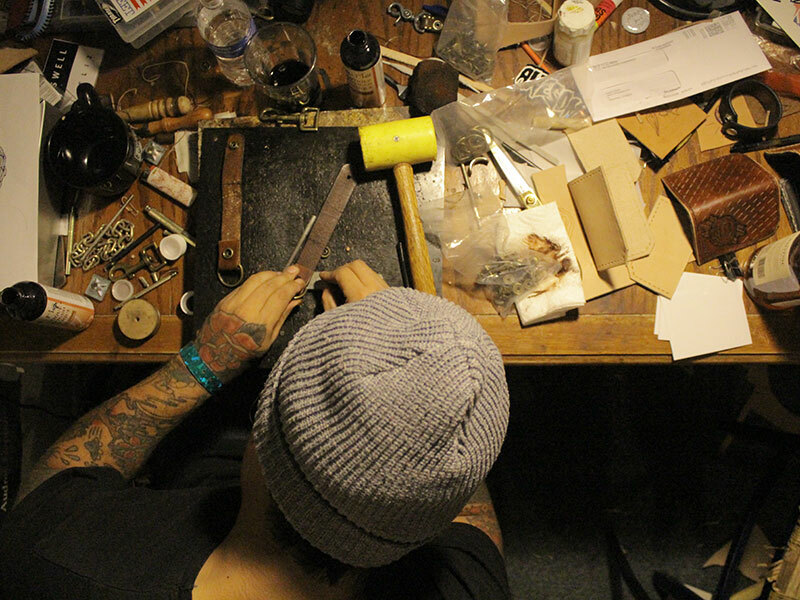 He wanted to create the accessories we use every day, like wallets and belts, and tastefully add to their appearance by carving in his traditional tattoo inspired style of art. 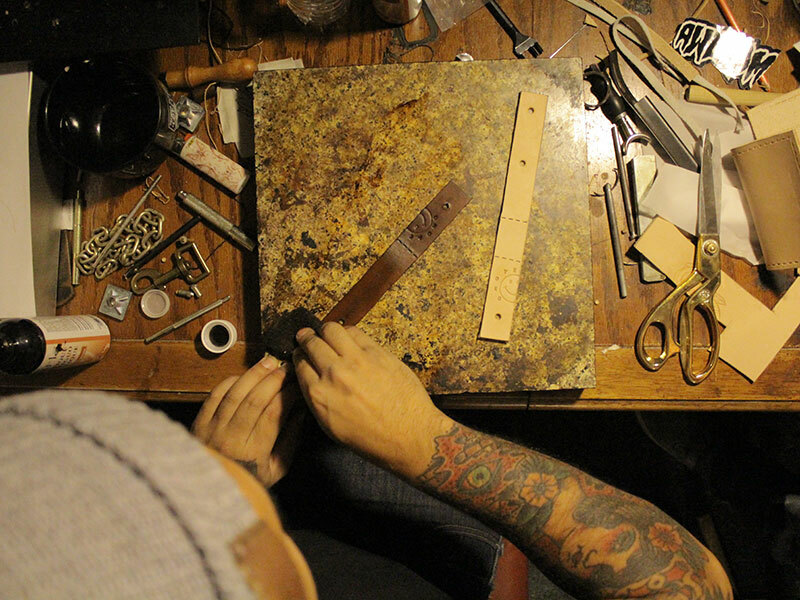 Unsure if he would stick with it, he purchased an inexpensive leather making starter kit that included basic tools and precut leather pieces and began teaching himself how to construct belts and wallets. 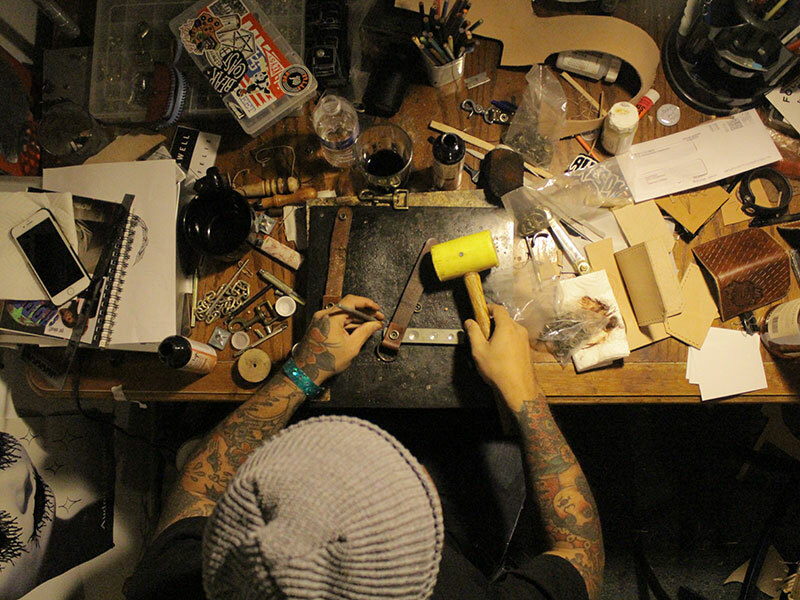 Realizing he would need to improve his drawing skills to create the art for the leather products, he began progressing with a lot of practice and guidance from his tattoo artist friends. After a couple months of trial and error, he got his first customer purchase.